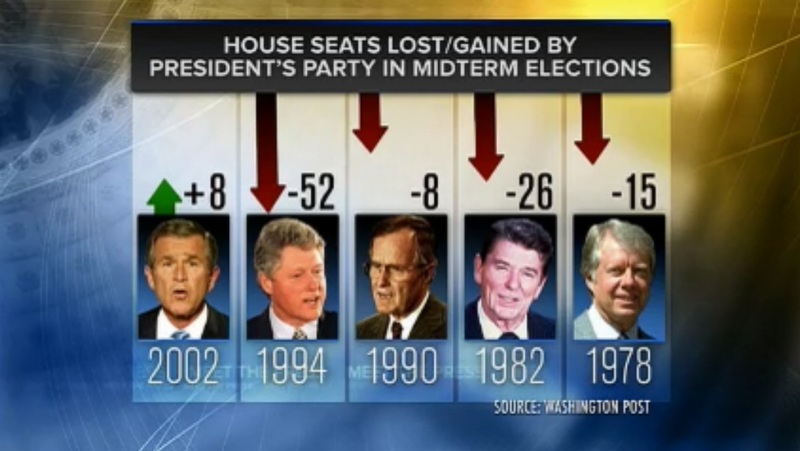 According to Nate Silver’s (Five Thirty Eight) latest House forecast (September 9), Democrats will loose more seats in November than the party in power did in 1978 and 1982 combined, but less than the Democrats did in 1994: 45,3 seats. Republicans have a 2/3 chance of gaining a majority in the House come November. Odds are Rep. John Boehner (R-OH) will be the new Speaker of the House. But it’s a long time between now and November, and 99 House seats are still in play. 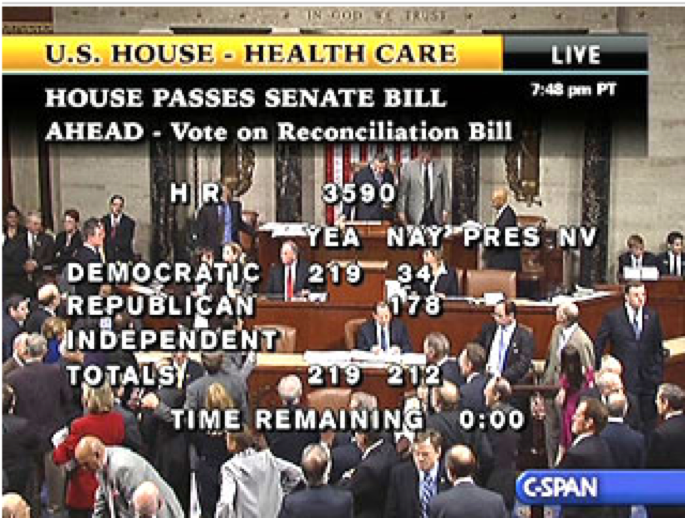 In the end, the Democrats not only got 216 votes, but 219 (and 220). This way, no single Democrat can be accused by his or her opponent in the upcoming midterm elections of having been the single vote who tipped the tally in the favor of the Democrats. Tonight’s vote is not a victory for any one party. It’s a victory for them. It’s a victory for the American people, and it’s a victory for common sense. … We proved that we are still a people capable of doing big things. … We proved that this government — a government of the people and by the people — still works for the people. Strict partisanship has carried the day, and our health care system will never be the same. We have failed to listen to America. And We have failed to reflect the will of our constituents. 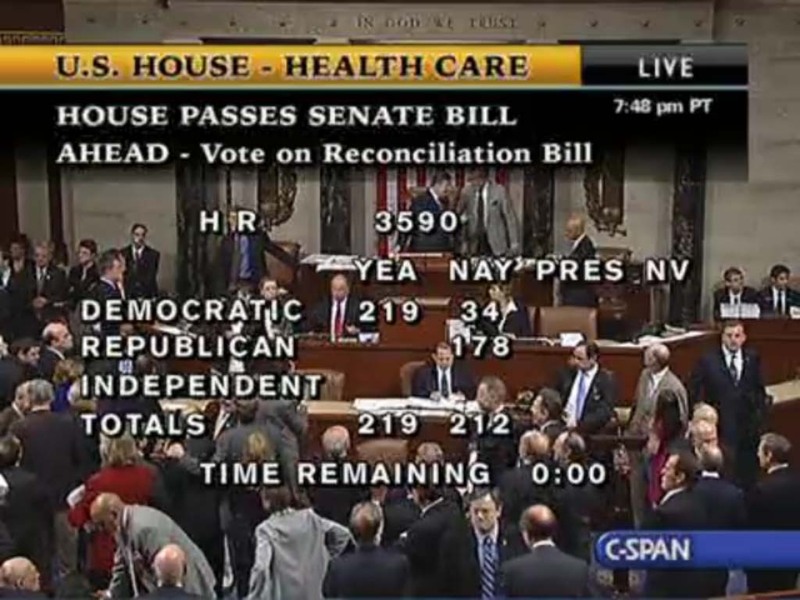 Even if you disagree with the content of the health care reform awaiting the signature of President Obama, the fact remains: History was made today. Read more here: Washington Post, The New York Times, Wall Street Journal, Roll Call, Washington Examiner, The New Republic. As I pointed out last Sunday, when the White House wants a certain message out there, one of their representatives headline Meet The Press and This Week. Last week it was Health & Human Services Secreteary Kathleen Sebelius. 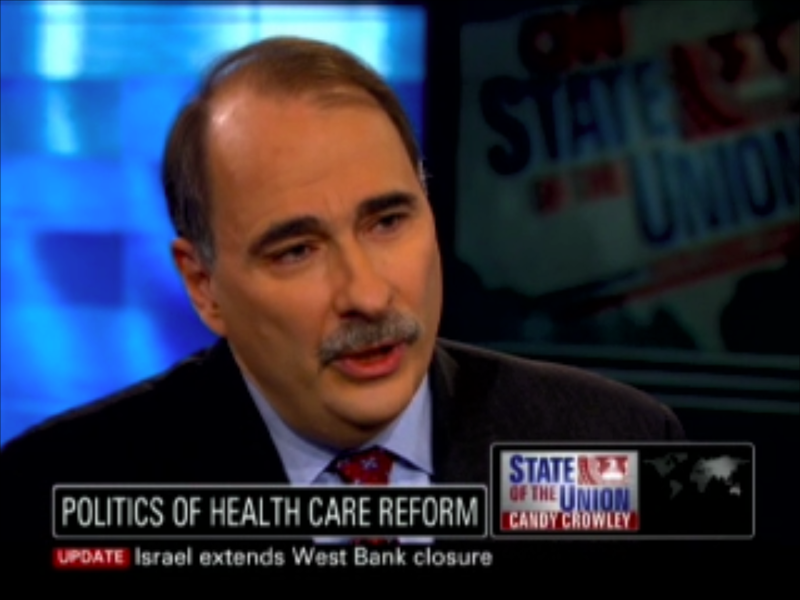 This week it was Obama’s Senior Adviser David Axelrod – who also headlined State of the Union. Axelrod certainly had his talking points down, and his most repeated phrase was that the American people ”deserves an up or down vote on health care”, a line repeated on This Week by former Obama White House communications director Anita Dunn. First, the House will be voting on the Senate bill, which was approved in December. The House will then also vote on a package of changes via reconciliation. That’s a procedure that they can get passed on a majority vote mostly to do with budget items. The president then would sign the Senate health bill if it gets passed. The Senate passes the House’s package of changes from reconciliation with a simple majority vote. 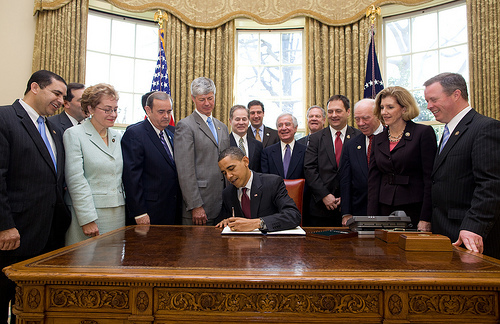 And then the president would sign the reconciliation bill. You describe a Washington Post columnist as “snarky.” You complain kind of consistently–and people in your position have done this for a long, long time–about the press coverage. You’re now at Fox News. Do you think that Fox News is fair to President Obama? I think they–on the news side, absolutely. I think they’ve got first-rate individuals at the White House who do their job in as an objective, fair and balanced way. Yeah, absolutely. MR. BROKAW: Let’s talk about this country and what’s going on here right now. You said to me over the weekend that you’re going to be spending more time looking at America because there’s so much going on at this time. Let’s share with our audience what David had to say recently about the political climate. 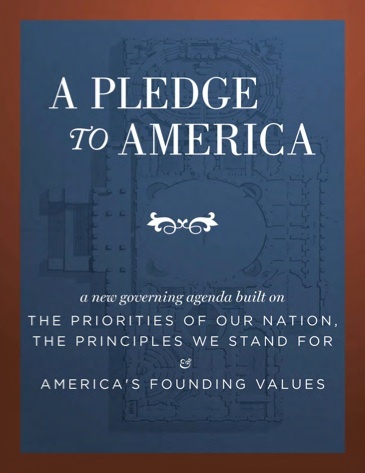 “In a sensible country, Obama would be able to clearly define [his modern brand of moderate progressivism] without fear of offending the people he needs to get legislation passed. But we don’t live in that country. We live in a country in which many people live in information cocoons in which they only talk to members of their own party and read blogs of their own sect.” Has the political culture been hijacked by the mechanics of the information technology? MR. BROOKS: Well, I do think everything–everybody gets to pick their own reality these days. The–a lot of liberals think Obama’s been very weak and he’s not forceful enough. I think he’s been amazingly tenacious on Afghanistan, on health care, on education. Pretty tough guy, I think. A lot of conservatives think he’s a socialist, trying to turn us into Sweden. Give me a break! Is that what this health care is about? But people like that because they want all differences to be 180 degrees rather than 30 degrees. And so they get to pick that reality because it makes them feel good. Brooks’ “information cocoons” can certainly be viewed as another product of The Opinionated Decade. MR. GRAHAM: … The interview I just heard is spin, campaigning. I thought the campaigning was over. Are you trying to tell me and the American people that Scott Brown got elected campaigning against a Washington bill that really is just like the Massachusetts bill? The American people are getting tired of this crap. No way in the world is what they did in Massachusetts like what we’re about to do in Washington. We didn’t cut Medicare — they didn’t cut Medicare when they passed the bill in Massachusetts. They didn’t raise $500 billion on the American people when they passed the bill in Massachusetts. To suggest that Scott Brown is basically campaigning against the bill in Washington that is like the one in Massachusetts is complete spin. I’ve been in bipartisan deals, I was in the “gang of 14” to stop the Senate from blowing up when the Republicans wanted to change the rules and use the majority vote to get judges through. If they do this, it’s going to poison the well for anything else they would like to achieve this year or thereafter. On a lighter note, Tapper hinted at the Massa-saga by stating that he couldn’t “promise any tickle fights” in the introduction of the Roundtable. George, Congressman, former Congressman Ray LaHood, who is now the transportation secretary, but was a Republican member of Congress, he has an op-ed in the Chicago Tribune saying — talking about why, as a member of the House, he would have voted for this bill, because this bill reduces the deficit and also brings down health care costs, and it will make insurance more affordable. Do you believe he would have voted for it as a Republican congressman? Not a bit. It reduces the deficit because you have ten years of taxes and six years of benefits and other accounting gimmicks. You have said a moment ago essentially what Mr. Axelrod said there, which is, gosh, the American people like elements of this bill so let’s pass this bill. I like sauerkraut and I like ice cream. I don’t like sauerkraut ice cream. When you put this mish-mash together — the public has looked at it. Now, Nancy Pelosi said this week, we have to pass this bill so we can find out what’s in it. I think the American people already know what’s in it. DUNN: I’m not actually sure you ever tried sauerkraut ice cream and I’m not sure anybody has. TAPPER: It is quite scrumptious. DUNN: It could be very good. TAPPER: Speaking of the process argument, in the last few weeks, this town has been obsessed with this palace intrigue story of whether or not the fact that the bill has had such troubles getting passed, is the fault of the president’s advisers, whether David Axelrod, who was here earlier, or White House Chief of Staff Rahm Emanuel. In fact, Rahm, if you look at the covers of the New York Times magazine and the New Republic, he is quite the cover boy. And Anita, having worked with these two men, Axelrod portrayed as something of the president’s liberal conscience, Emanuel portrayed as the pragmatic deal maker. Is this story of in-fighting and palace intrigue, is it fair? DUNN: It’s a very overblown story. Are there disagreements among the president’s advisers? Of course. They’re human beings and everybody brings different things to the table. But you know, David and Rahm, who are very old friends, are kind of like the Oscar and Felix of the White House. Right? They are different stylistically, but they’re not all that different when it comes to their approach. And where they are totally united is in their commitment to the president and what he wants to get done. So I think these stories, you know, when things — when White Houses hit a rough patch in this town, people go from being smart to being stupid in about a nanosecond. And I think that’s kind of where we are right now. I’ll put myself in the realms of the stupid right now, but the reality is that I think this is one of the more overblown stories you’re going to see. ROBERTS: You have White House intrigue stories when things are going badly. When things are going well, it’s a well-oiled machine and everything is, you know, and everyone is behaving well and all that. When things start to fall apart, you get these stories. CROWLEY: What’s the Republican role now on the House side? What is there left for you all to do? BOEHNER: I’m doing everything I can to prevent this bill from becoming law. Plain and simple. We have offered our ideas. CROWLEY: And what do you do? CROWLEY: You had the summit. BOEHNER: Oh, they had the summit. We offered our ideas. CROWLEY: And he incorporated some, did he not? 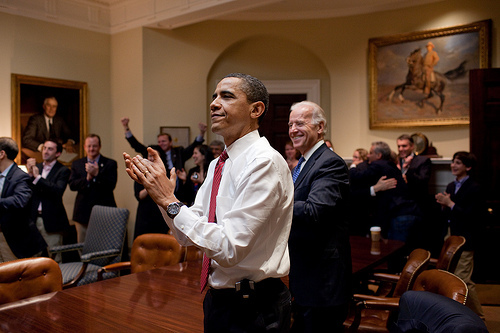 BOEHNER: That — and — and took a couple of Republican bread crumbs and put them on top of their 2,700 page bill. That’s not good enough. And so while — what I’m doing is working with my colleagues to keep the American people engaged in this fight. I don’t have enough votes on my side of the aisle to stop the bill. But I, along with a majority of the American people who are opposed to this, can stop this bill. And we’re going to do everything we can to make it difficult for them, if not impossible to pass the bill. You have said a moment ago essentially what Mr. Axelrod said there, which is, gosh, the American people like elements of this bill so let’s pass this bill. I like sauerkraut and I like ice cream. I don’t like sauerkraut ice cream.